Wednesday, 1st May 2013 was the 8th day of Sri Parthasarathi Swami Brahmothsavam. .. this is very special – not only for the ‘aesal (oyyali)’ that occurs at Car Street but more so for the ‘Thirumangai Mannan Vaibhavam’. 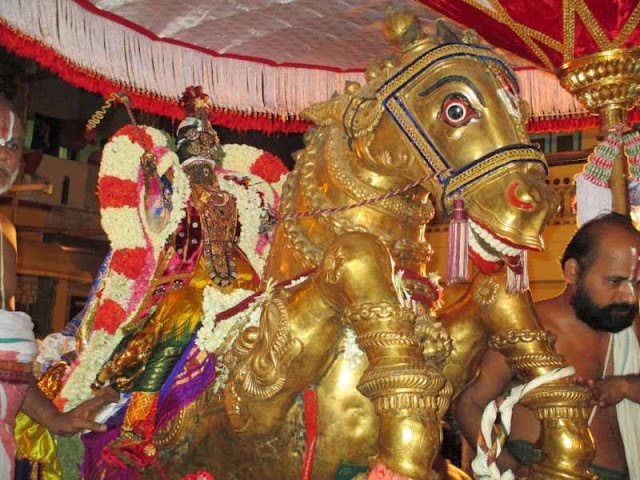 The Lord holds the reins of the golden horse – Azhwar Kaliyan comes chasing on his ‘adalma’. Neelan, kaliyan – known by various other names was a local chieftain’ who used to feed thousands everyday. He had vowed to feed thousands of persons each day and also needed money to build temples. Thirumangai mannan’s disciples were -Neermel nadappan, Nizhalil odhunguvan,Thaloodhuvan, Tholavazhakkan. Not finding enough resources he and his disciples had to resort to robbery and Sriman Narayanan in his various Leelas chose to play with him, by getting robbed, making him realize his folly and turning him to his trusted devotee. 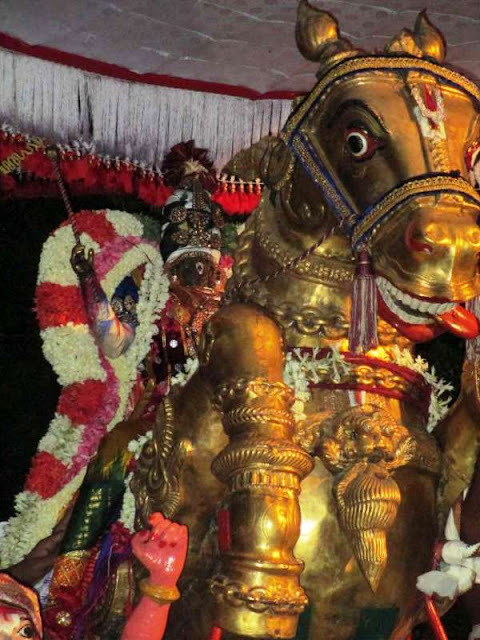 Kaliyan understanding the significance became Thirumangai Azhwaar and rendered Periya Thirumozhi; in Naalayira Divyaprabandham, Thirumangai mannan has contributed 1137 hymns. Neelan, ordained to listen to the Ashtakshra mantra, becomes Thirumangai Azhwar. 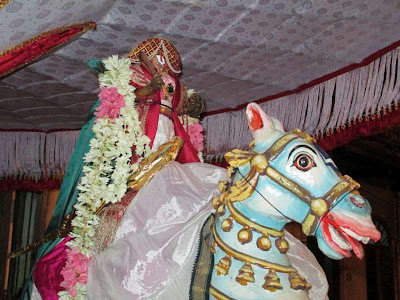 In the photo of Azhwar on the small horse, one can see him armed with sword and shield. This divine act is recalled and as stated in the ‘sthala puranam of Thiruvallikkeni’ – Perumal and those accompanying Him lose their valuables. 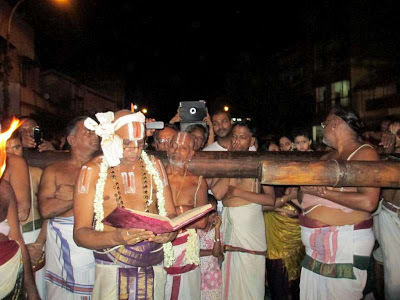 The entire act is read out in a sanctimonious rite called ‘pattolai’ (literally the verses in palm leaves covered with silk) – which is rendered by Dr M.A. Venkatakrishnan Swami in his inimitable style. In the Thiruvallikkeni Sthala puranam, Emperuman and those accompanying him lose their gold, jewelry and valuables. 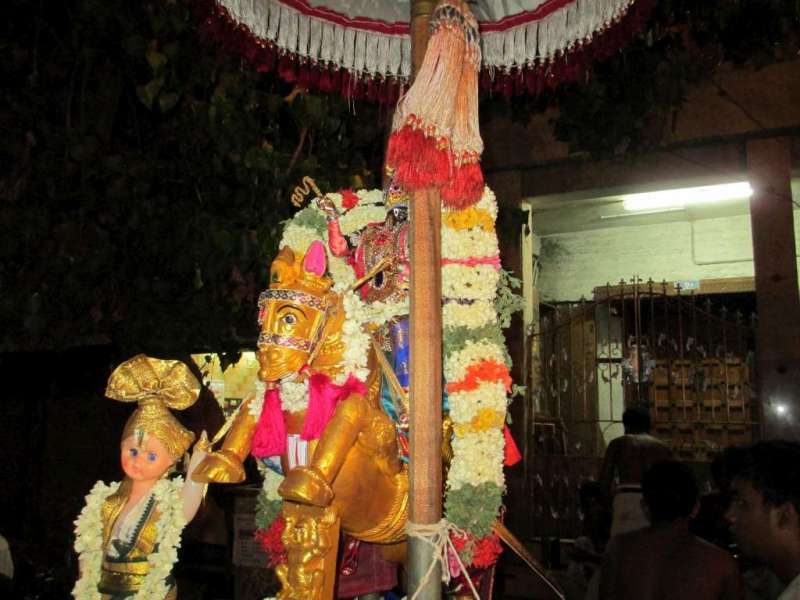 The ‘Thalayari Thalaivan’ of the place stands before the Perumal with folded hands, pleads forbearance, chases Aalinadan, recovers the ornaments and punishes the mischief monger. After the enactment of this, Kaliyan learns ‘Ashtakshara mantra’ and in the purappadu the opening of Periya Thirumozhi ‘"வாடினேன் வாடி வருந்தினேன்" ~ is rendered. திருமாலடியார்களுக்கும் அவர் தமக்கு தொண்டு செய்பவர்களுக்கும், என்றென்றும் சகலவிதமான செல்வங்களும் பெருகும்; அவர்களுக்கு எல்லா நன்மையையும் நடக்கும். நாம் செய்ய வேண்டியது எல்லாம் - ஸ்ரீமான் நாராயணன் திருவடிகளில் ஈடுபாடு கொண்டு, அவனது அடியார்களுக்கு எல்லா கைங்கர்யங்களும் செய்ய வேண்டியது மட்டுமே! திருமங்கை மன்னனின் 'பெரிய திருமொழி - முதற்பத்து - முதல் திருமொழியில்' உள்ள இப்பாடல் நம் இல்லங்களில் எப்போதும் ஒலிக்க வேண்டும். நலம் தரும் சொல்லை நான் கண்டு கொண்டேன் * நாராயணா என்னும் நாமம். நாராயணா என்னும் நாமம் நல்ல சுற்றத்தைத் தரும். ஐசுவரியத்தைத் தரும். அடியவர்கள் படும் துயரங்களையெல்லாம் தரைமட்டமாக்கி (நிலந்தரம்), பரமபதத்தைக் கொடுக்கும் (நீள்விசும்பு),அருளோடு கைங்கரியம் என்னும் ஸ்தானத்தையும் கொடுக்கும், வலிமை கொடுக்கும்,மற்றெல்லாம் தரும். பெற்ற தாயை விட அதிகமான பரிவைத் தரும். நல்லதே தரும் சொல் ‘நாராயணா என்னும் நாமம்’. 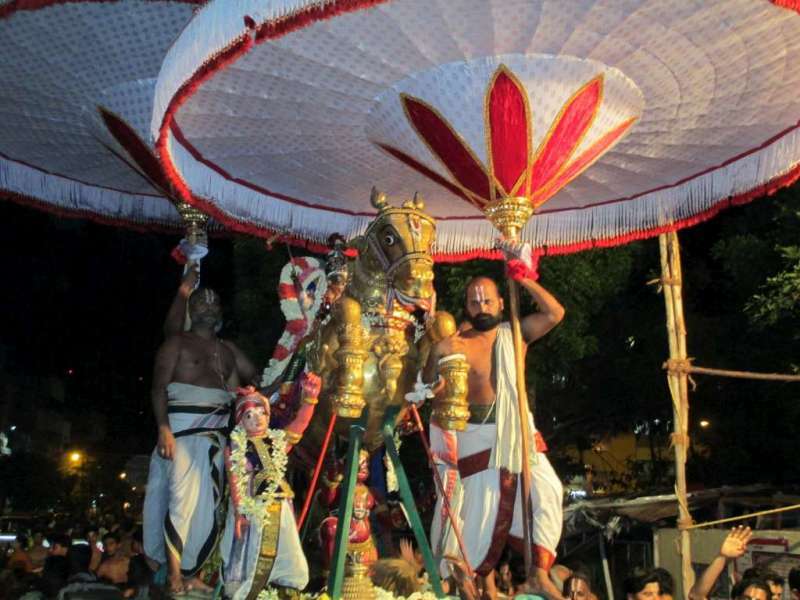 Here are some photos of the Kuthirai vahana purappadu. 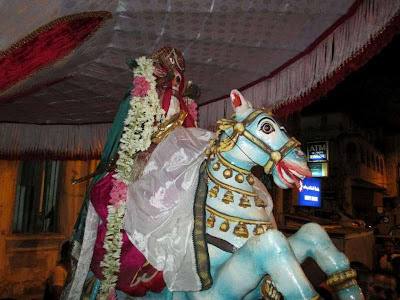 The bigger horse is that of Perumal; Thirumangai mannan also comes in a horse [smaller one]; then there was the horse of the Perumal [that of chinna pasanga] ~ all providing a great treat to the bakthas and bagavathas at Thiruvallikkeni divyadesam. It was late in the night ~ but the enthusiasm and the crowd will have to be seen to be believed. 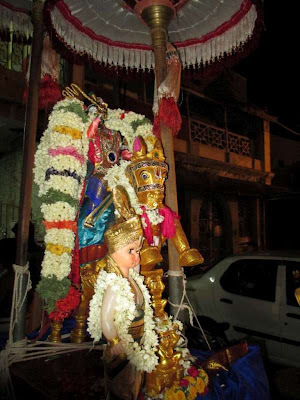 Azhwar Emperumanaar Jeeyar Thiruvadigale saranam.